One thing that makes your skin dull and unhealthy is stress. It can affect your whole personality in extreme cases. 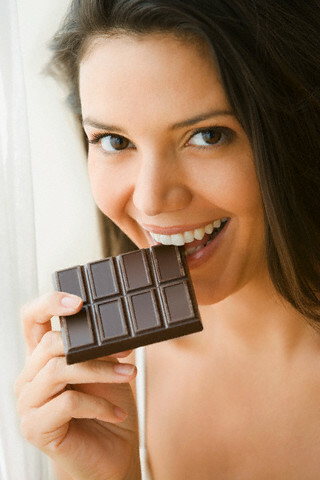 Dark chocolate is very beneficial in relieving stress and providing you a glowing skin. This is because it acts on stress hormones and prevent them from becoming active. Dark chocolate is rich in various minerals like magnesium and copper. These two minerals help in keeping the blood pressure under control. It is all the more beneficial to those who experience a fluctuation in their blood pressure. Having dark chocolate helps in checking the cholesterol level in the body. As you know, cholesterol blocks the arteries and veins and reduces the proper flow of blood through them. Dark chocolate help in reducing the bad cholesterol (LDL) in the heart and the arteries and ensure proper blood circulation. it also aids in the production of good cholesterol, HDL, in the body. As was discussed earlier, the flavanoids present in dark chocolate increases the blood circulation and its flow to the brain. Because of this increased flow of blood, your eyesight is greatly improved. So if you have poor eyesight, you may consume dark chocolate now and then. The presence of anti-oxidants like flavonoids present in dark chocolate reverses the damaging actions of the free radicals in the body and prevent the signs of aging and protect the heart from any diseases. Stress affects your health and you must always keep away from getting stressed. Dark chocolate contains ingredients that are very beneficial in the production of endorphins by the brain. Endorphins improve your mood and make you relaxed. so if you are depressed, have some dark chocolate and see how it lifts up your mood. it is found to be beneficial for those who suffer from bipolar disorder and emotional stress, as well as those who suffer from mood swings. The flavonoids present in dark chocolate has a lot of positive effects on your body. One of its benefits is that it protects your skin from the harmful effects of ultra violet rays of the sun, preventing sun burns and reducing the risk of skin cancer. When the level of flavanoids called epicatechin is high in the body, your brain is protected from strokes. Dark chocolate is a good source of epicatechin. So if you consume dark chocolate, the risk of stroke is much reduced compared to those who do not have any dark chocolate. Dark chocolate also improves the functions of the brain. It has been found effective in elderly people with slow memory power and other impairments of the brain. So, you can see that consuming dark chocolate is good for your skin, hair, eyes, brain, and it has many health benefits also. If you are a chocolate lover, make a practice of eating dark chocolates instead of other chocolates. This keeps your body healthy, away from various diseases.